With the holidays fast approaching, everyone seems to be ever so busy ticking off each and every item on their Christmas shopping list. I know I am! If you are like our family, we rather would really do away with the mall crowd. It has, for us, become so tiring to go about the mall rush especially at this time of the year. And please don't let me get started with the traffic. This is why more and more people are choosing to shop for Groupon Goods nowadays. We don't just save on gas and time, I also get that bang for our buck! I don't know about you but value for money has always been on top of our list. Deals on different items, whether a clothing brand, restaurant gift certificates, power bank, linens and bed sheets or that ever in demand Startastic Holiday Light Show projector, all of which are great gift ideas for this coming holiday. 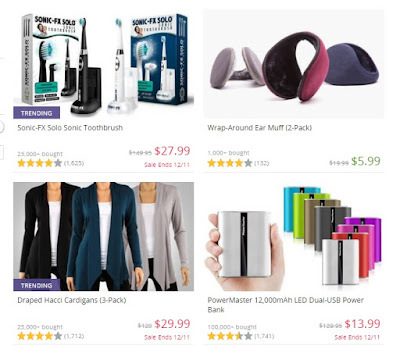 Group buying sites have sure mushroomed everywhere, but I love that Groupon remains to be that reliable choice and continues to be a money-saving avenue for us. Nothing beats saving money while holiday shopping at a click of button! Groupon is also on Facebook and Twitter, follow them for updates.